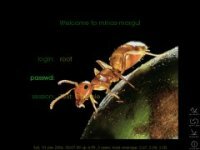 making linux easier for noob and kids by automatic login into linux, then startx and then shutdown the computer when they quit. qingy is not getty. and surely it is not x display manager. but it's a getty replacement. just like getty, it ask you for login and let you access your linux according to your login. beyond login, qingy can give you X session in addition to text/console session. you can even start multiple X session at once. so, it's (almost) a perfect replacement for any x display manager like kdm/gdm/slim/xdm/wdm. especially usefull for ubuntu / debian minimal desktop installation. save you a lot of system resources on legacy computers. that's it. now you can reboot and get into qingy instead of x display manager. thanks for stumpleupon on this. so, when other distros fail me, i always return to debian. it's a little bit harder to setup, but it (almost) always works on any hardware i have. i dont burn it. coz, i cant use the cd drive anymore. first, you need to install grub on ntfs. this is how i install freevo on ubuntu hardy using apt-get to get packages from ubuntu intrepid. # remove temporary files, be careful where you point that loaded rm -rf! btw. similar setup can be used to make it work on debian stable. continuing my popular howto easily configure x display, here are other ways to configure X display driver in Linux. you might also want to backup xorg.conf from each step result and then choose the one that satisfy you most. sudo rm /etc/X11/xorg.conf # just remove the xorg.conf. usualy, X will try to configure itself. if you have gdm installed, kill it with Ctrl-Alt-Backspace until it gives safe mode. or intentionally breaks xorg.conf with wrong entries. as always, most stuffs should also works with debian and derivatives. that's all it. now i can use the wifi from ubuntu 8.04 hardy. (it should also works on all other linux distros). update: reports said it also works on ubuntu 8.10 intrepid. after few times you do aptitude full-upgrade, you will end up with many kernel images. many people new to linux dont even know it's there. but it's there. and it can be many of them. wasting quite some spaces, especially if you're on old small 4gig harddrive, it matters a lot. well... there're many ways you can remove old kernel on ubuntu. and here's my way..
that will also show installed old linux-header (source). you might want to remove them too. that should reclaim at least few hundreds megs space. guess what... it also works on debian and all distros based on these two. blogspot now have a new gadget that allow us to put our blog list to our sidebar. you might already have blogrolls using some other services. maybe the google reader's or others. and you can guess it already. this new blog roll is 100% SEO and it can even raise your other blogs pagerank. update: wonder why ajaxsearch do not include bloglist in the search result? just found another great resources on htaccess blacklist by perishable press. it's called ultimate htaccess blacklist. 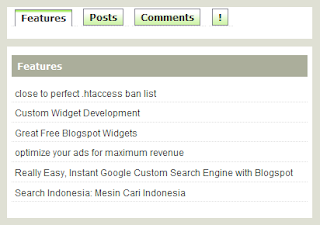 similar to my previous close to perfect htaccess ban list from webmasterworld forum. but the htaccess have all the rewritecond in one single super long line. also, it have very nice and almost complete htaccess stuffs. then, it's also building so-called 3G - third generation - blacklist which include a bunch of redirectmatch stuffs. but be carefull with these. they could/might breaks your cms if you do not understand the logics there. i just create another widget that allow you - easily,instantly - turns anything into a great free blogspot widget and share it on your blogspot. sort of "widget builder" widget. just enter your owm custom html/js into it and your widget is ready to share! 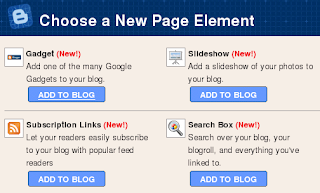 and with 2 clicks, anyone can have your widget on their blogspot. click and try it out! build your viral widget and share it to the world. following my previous very popular faster download from rapidshare megaupload etc post (which more server oriented tools), and seeing a lot of demand, here i gather more desktop tools to help you get unlimited download faster from rapidshare, megaupload, sendspace, hyperupload, ultrashare, etc..
not all tools here is tested but i try to gather information and found them somewhat popular. universal share downloader, good reviews from others. support proxy. semi automatic. most recommended: ultimate file search. rapidshare/megaupload/torrent,etc. seek and found any file here. warn: i have not (yet) test them all. secure your windows with good antivirus and antispyware before trying any of them! oo... dont limit yourself with rapidshare. seek your file here for easier downloads. make any of your blogspot widget as tabview just like this one. i just installed ubuntu hardy on an old 400mhz computer with 192meg ram. i setup ubuntu minimal desktop on this old computer. it took more than 1 hour downloading few hundreds megs packages with 1mbps internet link and another 1 hour unpacking and installing almost 600 packages. and after all that, i can not startx! tried 'sudo X -configure' then 'sudo cp ~/xorg.conf.new /etc/X11/xorg.conf' and still X wont start. it's and old sis vga with 4 meg ram. here's a trick to configure X. what!? what gdm have to do with configuring X!? when ubuntu try start gdm and fail, it keep trying with different configuration. after too many fails, it give a low-res X. something like windows safe-mode. then you have option to configure your display or just continue using low-res mode. off course, you should first try to configure X. just select your vga card from the list and do the test to see if it works. it works for me. i just select my vga type and everything works out ok.
how do you configure your X when other things fail? my guess is because i recently change the 'View Cart' button become optional. this is an example why you should listen to your users. thank you all who use my widgets !! 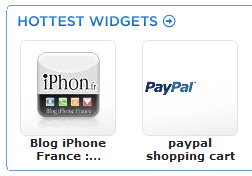 it's quite some times already that Paypal launches Storefront Widget. however i just found out that recently. so i create a widgetbox and clearspring widget out of it so that i can easily put it anywhere i want to. today, i convert Paypal Storefront Widget as Facebook Apps so now everyone can start selling on Facebook. it's up to you, you like the simple paypal shopping cart or this more advanced storefront widget. both available as facebook apps. Sign up for PayPal! more..
first, build the widget then click the 'get & share' button and start selling now! it's mostly only like a wrapper to the paypal original widget. so, if the paypal original widget works, this should also works without problem. this widget is made by me. so, if it works or not you can contact me. dont ask paypal for the support. tnx. update: it's now myspace compatible! Get the google-cref widget and many other great free widgets at Widgetbox! following my previous Easy, Instant Google Custom Search Engine with Blogspot post (part 1), the search engine can only shown on your blogspot web. now that i create the google cref widget, you are now free to put your search engine on any other web. that's what i call Really Easy, Instant Google Custom Search Engine with Blogspot (TM). it was created for my own use. but i do hope you like it as much i me. if you have try/made some CSE (custom search engine) you might find it a bit tedious maintaining the engine. even start making it will need quite some work. now with blogger-in-draft new (quite old already) search box, we can instantly make any CSE we like very easily. just make some link lists and put in the search box and instantly you have yourself a CSE just the way you like it. and, it's also very easy maintaining your CSE. just regularly check and keep your link list updated and your CSE should always perform well. 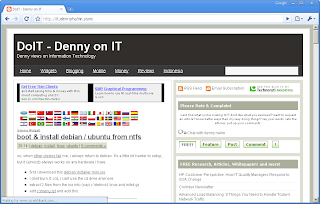 you can test my CSE at my new virtualization blog and the special linux search engine. cant remember when the last time i bought a new computer. it was the latest technology when i bought it. it's celeron 800mhz which i still use till now. since then, i never (want) to buy any new computer. either it be laptop or desktop or even servers, i use 'old' refurbished computers. now, all my computers are either pentium II or pentium III or celeron the most 'powerful'. i have one celeron on my laptop, pentium 3 on another laptop. 2 desktops with p2 inside. 1 mail server with p3 and another firewall/router/proxy using p3 also. and all the computers fully satisfy all my needs. ooh... i forgot i just bought another refurbished p4 hyperthreading computer which i used at this very moment. it's only 2.8ghz and 512meg ddr1 ram. and i put latest centos 5.1 in it plus openvz plus virtualbox. now, almost everything is in this box. and coz too many servers i put into this box, it seem a bit slower, especially with it's only 512meg ram. this. is my urge to get a new computer. coz i want to put dozens of servers (virtual machines) into this one box. i want my firewall/router/proxy in it. then a zimbra collaboration server. then web hosting platform, (maybe lxadmin hostinabox?). and maybe another dozens of other servers i can put into it. like the celeron that i still use, this new computer should last at least ten years and should only retire after/when it's dead. :) that's how i use my stuffs. my cellulars, my tv, my computers, all used up till the very end of their life! so. what's your urge to purchase a new computer?